Stay healthy with regular chiropractic care! After the investment of time needed on the initial visit(s), many patients become concerned that every visit will be of equal length. This is not true as typical office visits are significantly less time consuming. But don’t think the brevity of a regular visit lessens its value! Most treatments start with the application of physical therapy modalities in our comfortable therapy area. You will then go into a private room where other techniques such as manual therapy, spinal adjustments, traction and movement activities can be performed. 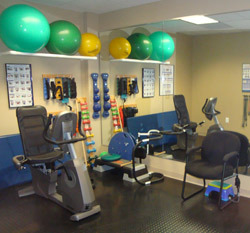 Many treatment plans will include supervised one on one exercise programs in our well equipped gym. Like a regular workout program, each visit builds on the ones before. Following your recommended treatment plan helps to avoid losing the momentum necessary to make the needed improvements in your health. We recognize your time is valuable. So we do everything possible to run on time and minimize the impact on your busy life. Call us to get started with chiropractic care today!